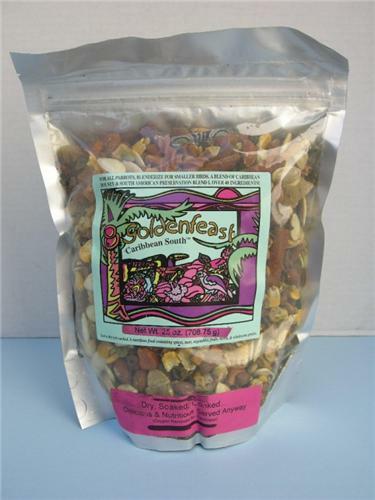 Goldenfeast's Caribbean South Blend 25oz. Like this one and their Dried Veges, Madagasgar Mix, Schmidts Original, Fruit pudding II. INGREDIENTS: Roasted almonds, dry roasted soybeans, rolled corn, dehydrated carrots, diced papaya, cherries, white pumpkin seed, cashews, Goldenfeast® Granola (consisting of: rolled oats, rolled wheat, brown sugar, canola oil, un-sulfured dehydrated coconut, sweet dairy whey, oat flour, roasted almonds and honey), Brazil nuts, cooked dehydrated assorted beans, dehydrated diced mangos, spicy tomato pasta, shelled raw filberts, dehydrated peaches, shelled almonds, dehydrated cranberries, banana chips, sun dried apricots, cooked dehydrated sweet corn, dehydrated apples, cantaloupe seed, dehydrated blueberries, pine nuts, diced pineapple, whole cinnamon, whole Turkish dates, dehydrated white grapes, spinach pasta, shelled walnuts, pepitas (shelled pumpkin seed), dehydrated sweet peppers, dehydrated celery, dehydrated strawberries, dehydrated zucchini, freeze dried garden peas, sweet basil, dehydrated cilantro and freeze dried chives, dried Lactobacillus acidophilus fermentation product, dried Lactobacillus casei fermentation product, dried Lactobacillus plantarum fermentation product, dried Lactobacillus fermentum fermentation product, dried Enterococcus faecium fermentation product, and dried Bifidobacterium longum fermentation product, and natural flavoring. GUARANTEED ANALYSIS: Crude Protein (min.) 12%; Crude Fat (min.) 5%; Crude Fiber (max.) 5%; Moisture (max. )6%; Ash (Max) 6%. Goldenfeast's Nutmeats and Fruits 23oz.